Featured above, a new 25-inch Retro-Fit model, available with the water-saving New Tempesta Cosmopolitan hand shower and showerhead, for shower and tub combinations. 1. Not all showerheads are created equal. Different showerheads emit water at different rates, and that “flow rate” affects how efficient a showerhead is – or isn’t. Federal law limits the maximum allowable flow rate to 2.5 gallons per minute (gpm) for showerheads, but some have even lower flow rates. The less water that comes out of the showerhead per minute, the less water that will get wasted down the drain. If your showerhead pre-dates 1980, it could be using more than 5 gpm. Replacing a less efficient showerhead with one that has a lower flow rate, like the many GROHE showerheads and hand showers with EcoJoy technology, can save water and money – without sacrificing performance. 2. You can renovate a shower without tearing through the wall. Updating a shower can improve its efficiency and your shower experience, yet the potential need to open a bathroom wall may make you hesitate. “Shower renovations don’t have to require major re-plumbing,” said Cheryl Dixon, Head of Brand Trade and Marketing for GROHE. The GROHE Retro-Fit Shower System can be installed in less than an hour, connecting to your existing plumbing system without breaking the tile wall, and comes standard with a hand shower as well as a traditional showerhead. With three recently introduced models, the system makes it easy to renovate a shower and update a bathroom, even if you’re a renter who wants a quick and easy upgrade. 3. 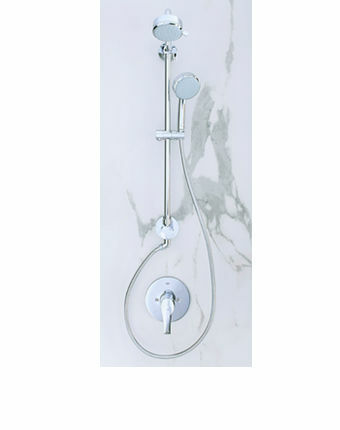 Thermostatic valves provide a customized, consistent shower. How much water goes down the shower drain while you’re waiting for the temperature to reach a comfortable level? “Adding a shower with a thermostatic valve not only ensures you’ll never again step into an icy shower stream or be surprised by a temperature fluctuation, it can also reduce the amount of water you use,” Dixon advises. GROHE’s GrohTherm 2000 thermostatic valve is a modern solution for both the bathtub and the shower, combining all the advantages of a thermostat with a perfect water experience. GrohTherm 2000 features GROHE CoolTouch® to avoid the risk of scalding, a functional tray for convenience and XL Waterfall for an aesthetic water flow. If you’re planning a bathroom renovation, a professional can easily install a thermostatic valve that will ensure water reaches the desired temperature sooner and stays at that temperature throughout your shower. 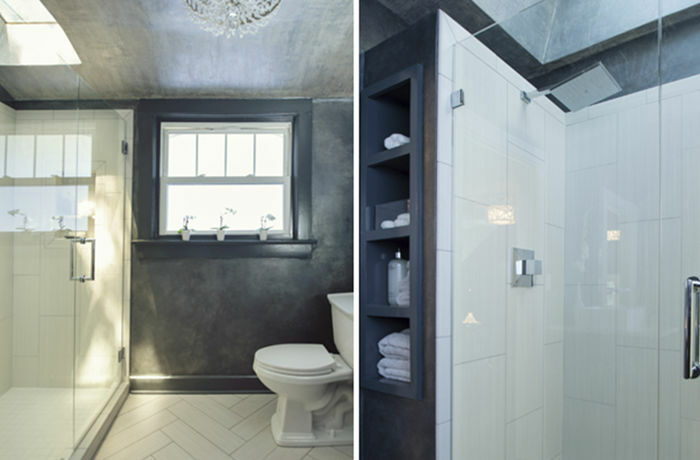 Featured above, the large and luxurious carriage house bathroom in the 2015 Kansas City Showhouse designed by Kathy Weiss, featuring the GROHE Rainshower® Allure showerhead. 4. Showers are growing. Bigger seems to be better when it comes to showers, and studies show that many people are significantly expanding the size of their showers during renovations. Larger showers are ideal places for relaxation and rejuvenation, and walk-in showers with oversize panes of glass, multiple water sources and oversize rainshowers are becoming increasingly popular. Reducing shower time to about five minutes. Using technology such as thermostatic valves and digital controls to shower more efficiently. “Sustainability is a core principal during the design process at GROHE,” Dixon notes. “Between our water-saving technologies, faucets with adjustable flow rates and WaterSense products, we’re proud to be category leaders in that regard,” she concludes. Using less water is good for the environment, so you can feel positively about your water conservation efforts, all without losing any enjoyment of your shower experience. To learn more about more efficient and enjoyable showering, visit www.grohe.com.